The latest UTET Syllabus & Uttarakhand TET Exam Pattern has been updated on this page. So, the candidates who have applied for UTET 2019 can download Uttarakhand TET Syllabus & UTET Exam Pattern from this site for a free of cost. Here, we have also provided UTET Previous Year Question Papers. Therefore, download Uttarakhand TET Previous Year Question Papers from below and make your preparation more efficient. Also, Check UTET Notification 2019 details in the below table. Uttarakhand Teacher Eligibility Test (UTET) for filling up various Primary Teacher vacancies in Uttarakhand. Applicants who wish to apply for this examination must have complete knowledge about UTET Syllabus for Paper (1 & 2) and it’s Exam Pattern. Therefore, the detailed information about UTET Notification 2019 has been given in the above table. Therefore, the interested candidates can apply for UTET 2019 through Online before 30th September 2019. Uttarakhand Board of School Education has recently released Uttarakhand Teacher Eligibility Test Notification 2019. The Government of Uttarakhand is going to fill up various Teacher Vacancies in Uttarakhand Schools through this UTET 2018 Notification. So, the candidates who want to become teachers for the classes I to VIII Standard can apply for this Uttarakhand TET Exam 2019 before the last date through Online. But the aspirants who are applying for UTET Notification 2019 must fulfill all the eligibility conditions given in the official notification. UTET 2019 will be of two papers.The Paper 1 will be for the candidates who intend to be the teacher for classes I to V and Paper 2 will be for those aspirants who want to become the teacher for classes VI to VIII. Therefore, for the guidance of the applicants, we have provided UTET Syllabus & Uttarakhand TET Exam Pattern 2019 for both the papers. So, the individuals must download Uttarakhand TET Syllabus & UTET Exam Pattern from the below sections and start your exam preparation as early as possible. Here, we have also provided UTET Previous Questions Papers. The Uttarakhand TET Old Papers gives you the complete analysis regarding the question pattern. Therefore, the contenders must download Uttarakhand TET Previous Papers from the link provided below. Here is the good news for all the candidates who are searching for UTET Syllabus 2019. The Uttarakhand Teacher Syllabus along with the UTET Exam Pattern has been uploaded on this page. So, the individuals can free download UTET Syllabus & Uttarakhand TET Exam Pattern from here. The Uttarakhand TET Syllabus & Uttarakhand Teacher Exam Pattern helps you to plan well for the UTET 2019 and to score good marks and also to crack the Govt Jobs. Therefore, we advise all the participants to work hard and prepare well don’t miss the chance to enter into the Uttarakhand Govt Job Sector. Stay Tuned to our Recruitment Hunt website to get latest updates regarding all Govt Jobs in India. The UTET Paper 1 consists of 150 multiple choice questions for 150 Marks. There will be questions from 5 subjects and from each subject, 30 questions are asked. In UTET Paper 2, there will be 150 objective type multiple choice questions for 150 marks. Each question carries one marks and there will be no negative marking. Check above table for subject wise questions and marks. 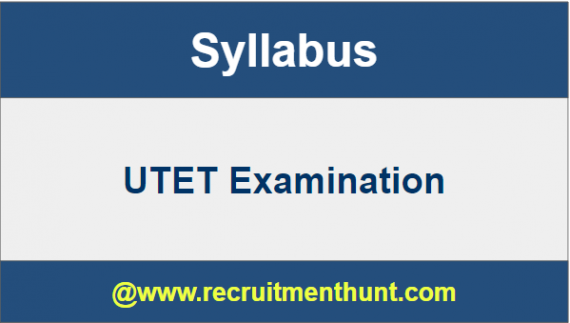 The complete and detailed topic wise UTET Syllabus has been provided below. The concept of development and its relationship with learning. The distinction between Assessment for learning and assessment of learning; School-Based Assessment, Continuous & Comprehensive Evaluation: perspective and practice. Children’s strategies of learning; learning as a social activity; social context of learning. Alternative conceptions of learning in children & understanding children’s ‘errors’ as significant steps in the learning process. Reading unseen passages – two passages one drama or prose and one poem with questions on comprehension, inference, grammar and verbal ability (Prose passage may be literary, scientific, narrative or discursive). The function of language and how children use it as a tool. Role of listening and speaking. The critical perspective on the role of grammar in learning a language for communicating ideas verbally and in written form. Challenges of teaching language in a diverse classroom; language difficulties, errors, and disorders. Teaching-learning materials: Textbook, multi-media materials, multilingual resource of the classroom. Two unseen prose passages (discursive or literary or narrative or scientific) with questions on comprehension, grammar, and verbal ability. Role of listening and speaking; the function of language and how children use it as a tool. Clothes, Dresses & their care. The significance of EVS & integrated EVS. Aims and Objectives of Teaching Social Studies. Finally, candidates can download UTET Syllabus here. Applicants can make their preparation easier by following UTET Syllabus and Exam Pattern. Download UTET Exam Pattern along with UTET Previous Year Papers through this article. Also, for more job updates subscribe and stay tuned to our website RecruitmentHunt.